November 19, 2018 – Diane wants to be known as a woman who inspires young people and as a change maker in her community and country! Diane is hopeful, despite a stressful year, that she will overcome challenges by managing her time and working hard! July 7, 2018 – Diane is still in classes, but when she does have her break she is planning on joining a group who will be screening for diabetes and hypertension in her community. She will do this for a week, and then for another week she will be training and teaching youth in Ngororero District about family planning and sexual transmitted diseases. May 12, 2018 – Diane values friendship, because whatever she does or wherever she will go she will always need help and advice from friends; she also values her relationship with Jesus because she believes in him no matter what and that he will always be with her! March 25, 2018 – When Diane was younger, she wanted to be a medical doctor in the military, however she found out she would not be accepted into the military due to being visually impaired. In five years, she will be starting her specialty in eye surgery to help others like herself! Feb 27, 2018 – Diane said the person who inspires her is Rwanda’s President, Paul Kagame, and she always feels inspired when she hears him speak! Jan 25, 2018 – Diane recently read a book called Torn Between Two, and it was interesting to her to read about how important it is to have strong character, even in the midst of receiving bad news. Dec 15, 2017 – Christmas in Rwanda is a day full of joy for Diane, she says that most people wear new clothes and host parties in their homes! She says her friends describe her as “honest” because she hates lying. Nov 11, 2017 – Diane is thankful for the These Numbers Have Faces staff and donors, she is also thankful for her mother! She loves seeing how happy people are during the Christmas holiday season! Oct 8, 2017 – During her summer, Diane did an internship in which she learned a lot about interacting with patients, after this experience she believes she will be a great doctor! She is very excited about her hospital rotations this year and being able to put into practice what she has been learning in her classes and through her internship. May 25, 2017 – Something Diane wishes more people knew about Rwanda is that it’s a country that values gender equality. March 28, 2017 – When asked about the 3 things she values most, Diane said integrity, believing in God and friendship! Jan 17, 2017 – Life isn’t without challenges. Last year was hard when Diane’s mom got sick and her younger sister started school. Finances were a struggle, but through it, Diane learned her responsibilities will help her gain maturity. Dec 8, 2016 – In 2017 Diane’s goals are to create a budget for her spending (so smart! ), concentrate on her studies, and spend more time in prayer! Nov 20, 2016 – When asked about what she’s thankful for, Diane said the opportunity to study. Before she was part of TNHF, she didn’t think she would be able to go to University. We’re so glad she is! Oct 14, 2016 – Some of the highlights of Diane’s summer were teaching about contraceptives at her community’s health center, and going to the African Youth Leadership Forum Conference in DR Congo! April 20, 2016 – When Diane thinks of role model leaders, she pictures Rwandan President Paul Kagame. What Diane admires most about Kagame is how he has worked to unite the country — for Rwanda to be known as a country of peace! Jan 21, 2016- Diane’s Community Impact Project is teaching secondary students about reproductive health. In addition to teaching, Diane is also doing advocacy work to increase emphasis on reproductive health in school curriculum! Dec 17, 2015 – As the new year approaches, Diane is making new goals! Diane said she hopes to practice kindness to all she meets. What a great goal, Diane! Oct 15, 2015 – How many languages does Diane speak? 4! English, Kinyarwanda, Swahili and French! June 19, 2015 – Diane only has three weeks for summer holiday, but during that time she is going to be working on her community impact project! Her project is to help teach her community about ways to treat and prevent common medical problems. April 8, 2015 – When Diane is feeling stressed, she likes to spend time with friends, doing their hair or singing gospel music together. Fellowship is an important part of Diane’s life! March 2, 2015 – Diane said her recent exams were difficult, but she did her best! She says she’s thankful for all those who prayed for her success! Jan 5, 2015 – A tradition in Diane’s family is gathering together to share meals. She is thankful that they were able to continue this practice during the holiday season! 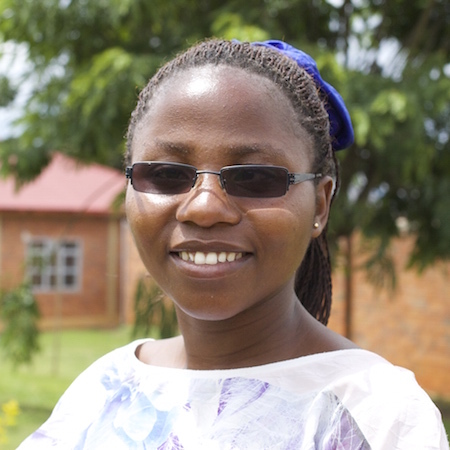 Dec 16, 2014 – Last week, Diane joined MEDSAR, a Rwandan medical student association! Diane said she’s looking forward to connecting with others who share her passion. As a young child, Diane had an eye problem that went untreated due to the lack of optometrists in her community. She is now studying Medicine at the National University of Rwanda. She hopes to become an optometrist, serving her community and preventing such problems for children in the future! Although she knows her classes at university won’t be easy, she believes she will become a strong person because of them!